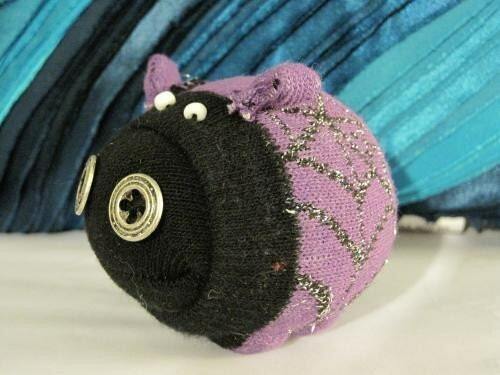 Pig from spider web patterned sock. ﻿ I LOVE to get creative with my teens. Watching them tap into their creative juices and work out the "how" of making something is one of the most rewarding points in working with teens. One program that is always a big hit is a program that I call "Creepy Cute Softies" and is a wonderful creative outlet as well as a way to learn basic sewing skills. Set out the supplies on a main table and let the teens choose which socks and supplies they want to use. 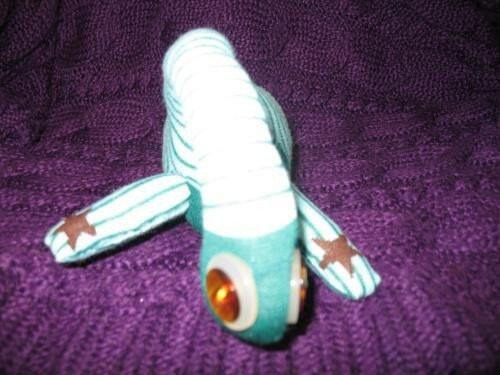 Use needle and cotton thread to stitch the basic creature together leaving a hole to stuff creature through. Fill creature with polyfill. NOTE: If using socks do not over fill the sock with stuffing as it becomes difficult to sew and not as attractive when finished. Next use the embroidery floss to add findings such as buttons, beads or machine parts or to stitch on eyes and nose. You should also have a decent supply of safety pins in stock so that teens who won't or can't sew can still do this craft. Let your teens make whatever kind of creature they desire - you'll be amazed what they can come up with. For inspiration put out a few books like Daniel's Stray Sock Sewing, Zombie Felties or Steampunk Softies by Nicola Tedman & Sarah Skeate. You can also show the movie Coraline in the background to really get to the heart of how creepy dolls can be. Cyberseams has some great basic instruction for hand stitching.